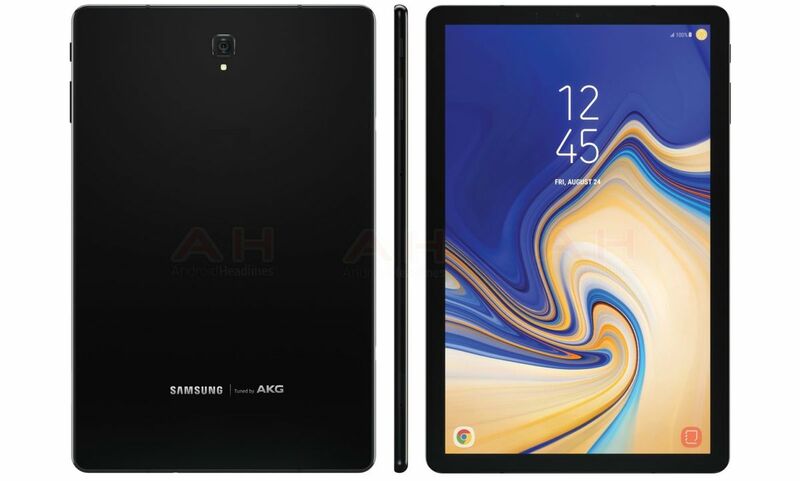 Images of the upcoming Samsung Galaxy Tab S4 have leaked, giving us a first look at the new tablet, which is rumored for a release later this year. What appears to be official press renders have leaked from an anonymous source to Android Headlines, showing a lack of a home button and a larger display. The Samsung Galaxy Tab S4 appears to have thinner bezels, leaving space for a longer display that might have a different aspect ratio than the Tab S3’s 4:3. The Samsung logo on the top bezel is gone, meaning that the tablet could potentially have space for a rumored iris scanner. Still, if there is an iris scanner, it can’t be seen in this render.